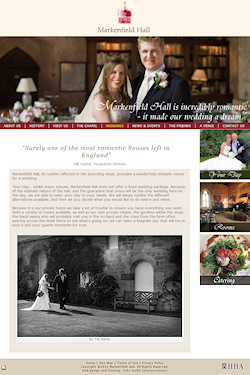 The previous website was considered rather drab and uninteresting, and together with a wish to raise Markenfield’s profile, our clients felt a redesign was essential to present the Hall’s features and facilities in a suitably informative and attractive manner. The new design incorporates a number of advanced features, with social media integration, response forms and the like. It is essentially a showcase for Markenfield, its history, present day activities and facilities, and as a must-visit destination for anybody interested in viewing a truly unique moated and crenellated country home dating back over more than 700 years. Featuring events listings, photo galleries, special events, academic information, ordering facilities for publications and a section devoted to the Friends of Markenfield, the website portrays Markenfield in all its many facets and will be a valuable addition to communicating with the world.